T-368 "Basic" SN:29 was originally purchased by KØDWC around 2009 from a ham in Texas. It was freight-shipped from Texas on a pallet with the transmitter wrapped in plastic wrap. KØDWC (Chuck) set up the transmitter in Virginia City, Nevada and operated it there for a few years. In 2013, Chuck wanted me to "go thru" his T-368 because of some minor problems he was experiencing. Also, Chuck was contemplating moving to Dayton in the near future so the absence of his T-3 wouldn't be too inconvenient at that time. Chuck and I disassembled the T-368 and moved it from Virginia City to my QTH in Dayton, a distance of about 10 miles. Within a very short time, Chuck did move from Virginia City to Dayton. His new radio shack was going to be too small for the T-368, so he offered the transmitter to me for a bargain price since it was already setting here, disassembled, at my QTH. I had started some preliminary inspections before I actually "owned" the transmitter. However, all of the rework described below was performed after I had purchased the T-368. As can be seen in these photos, I did all of my preliminary checkout and minor repairs with the three decks on the floor of the shop. This was due to the weight of each of the decks and the difficulty in getting them up on a workbench. Working on the T-368 Power Supply Deck - The power supply deck contains many of the relays used in the transmitter. These relays are located under a metal box shield that is held in place with two mounting screws. Removal of the shield provides access to the relays. All relays were checked for contact condition and positioning when energized or de-energized. Each transformer and each choke was tested for DCR (although this test is just going to find open windings.) Switches were checked for operation. Wiring and terminals were checked. Large socket for plug-in connector checked. 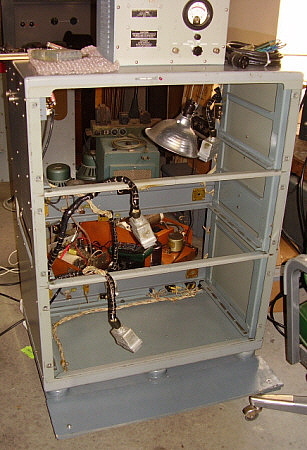 Solid-state rectifiers were replaced with 3B28 tubes. Chassis was cleaned. Working on the T-368 Modulator Deck - The modulator deck had a poorly installed modification to allow a crystal or dynamic mike to be used at the CARBON MICROPHONE connector on the front panel. This mod was removed and replaced with an easy, no parts removed mod for crystal or dynamic mike use. The mod only requires disconnecting the carbon mike bias wire and taping the end. Then connecting the mike input wire to the opposite side of the coupling capacitor. On this transmitter, the mike input wire was connected to a non-standard pin on the CARBON MICROPHONE connector for some reason. I returned the mike input to the correct pin to agree with the schematics. The Speech Amplifier had been modified to the latest version which replaces the RF chokes in the first audio amplifier with 10K resistors. This appeared to be either a late-version Speech Amp or the upgrade was professionally installed in an earlier version Speech Amp. I left the Speech Amp as found since it was the latest version. All switches were checked along with the wiring and condition of the various connection terminals used. Large socket for plug-in connector checked. Chassis cleaned. Working on the T-368 RF Deck - The RF deck needed a thorough cleaning and much of the hardware was somewhat loose. The finger contact for RF output had been removed and replaced with a piece of coaxial cable. I obtained a replacement finger contact and ceramic insulator which was then installed. I had to make a copper strap for connecting up the RF output contact. Two small coaxial cables were disconnected from their proper installation at the multiplier. These were for FSK and were disconnected because the front panel FSK input BNC had been modified to have an RF pick-up coil for waveform monitoring. I removed the RF pick-up coil and reconnected the FSK input cable and then reconnected the other end to the multiplier. The RF deck had been modified to the latest configuration of using two series RF plate chokes. This is usually found on the F-versions. The upgrade was professionally installed - probably by the military - so I left this upgrade as found. Checked switches. Micro-switch on PA BANDSWITCH was disconnected. Rewired back into circuit. Checked sockets for plug-in connectors. 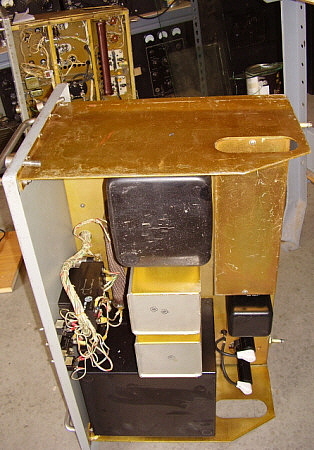 Photo left shows the cabinet which contains the main wiring harness and connectors along with the antenna relay. Many of the plastic support clamps were broken and that allowed the harness to rub against the modulator deck each time it was extended out. This action had cut several wires in the harness that had to be repaired along with installing new clamps. Photo right shows the power supply deck on its side. When first obtained, my T-368 had solid-state rectifiers. These were replaced with 3B28 tubes. Most of the transmitter relays are located under the box-shield. In the background is the bottom of the modulator deck. Photo far right shows the RF deck during testing. The RF deck had to be thoroughly checked over for cleanliness (+HV) and for loose mechanical fasteners. Working on the T-368 Cabinet - Initial inspection of the three decks and cabinet revealed that two of the large GE deck interlocks had been completely removed. The other interlocks were all bypassed with jumpers. I found some NOS GE 7760014 interlocks on eBay. Installation of these parts and removal of the jumpers got all of the interlocks working. My inspection of the RF cabinet also turned up two severe cuts to the wiring harness where it passes behind and to the side of the modulator deck. At least ten of the plastic loop supports were broken and this allowed the harness to drop from its proper position and to rub against the top side of the modulator deck. Over the years of many times extending the modulator deck out with the harness rubbing on the top side gusset had worn through the harness tape and had now rubbed into the wires. One wire was cut in two and several other wires had their insulation scraped off. This repair involved a well-insulated jumper installed to repair the cut wire and individually taping with electrician's tape the wires that had missing insulation. This was followed by re-taping that section of the harness. I couldn't find any plastic harness loops that were the correct clear plastic so I installed black plastic loops where any broken loops were found. These plastic loops position the harness more toward the cabinet sides and cross bracing out of the way of the three decks. Checked all plug-in connectors. The T-368 was now ready to reassemble. It takes two strong individuals to install the Power Supply deck. Luckily, it's the lowest deck in the cabinet. The Modulator deck is also fairly heavy and is easier to install with two individuals lifting. One strong person can handle the RF deck. If you don't have anyone to help with the lifting it is possible to use a hydraulic-lift table to position the decks. These tables have wheels for rolling the deck into position. They are rated for around 500 pounds, far more than the heaviest deck. The hydraulic-lift tables are sold at Harbor Freight for around $150. I had lifting help from a collector-friend,...but he did complain a lot afterward. HV Safety - The T-368 high voltage runs around +2500vdc. This level of potential is high enough to easily over-come your skin resistance and allow a lethal amount of current to flow from the point of contact through your body to the exit point on your body. If this current flows through the chest it can cause fatal defibrillating of the heart. It doesn't take very much current, only 10 mA can be fatal when that current is through the heart. Most of the time at lower potentials, your skin resistance protects you but, with a solid contact at +2500vdc, you won't have sufficient skin resistance to reduce the current flow below 10 mA. The safe way to troubleshoot the T-368 is to use circuit analysis with schematics and observation of the problem. This requires some experience and sufficient theoretical background to accomplish successful problem solving but it works and is safe. The manual provides resistance measurements and most problems can be found with a combination of visual inspection and "power-off" testing. For resistance measurements you can use tube socket extenders that provide access to all of the tube pins from the top of the chassis. +HV Warning - Don't even try to measure the +HV directly. Most modern DVMs don't even have a scale that high anyway. Older VOMs might have the scaling but it's not really necessary to know exactly what the +HV is anyway. If you have plate current, you have plate voltage. Nearly all problems can be found by circuit analysis and checking the involved components with the +HV and all other voltages off. photo above: Spring contacts for the +HV to the modulator tube plates connection thru the Mod deck. There are several of these types of spring-contact interlocks within the transmitter that automatically disconnect +HV or AC if one of the decks is pulled out with the power on. All of the spring contacts and the contact posts should be cleaned prior to operating the transmitter for the first time. Thorough Visual and DCR Check - Before applying AC power to a T-368 that hasn't been operational for awhile, or, if the transmitter has been disassembled and then reassembled, it's a good idea to do a thorough visual and DC resistance check before power is applied. With the back removed, check all tubes are seated in their proper sockets with their plate caps properly installed. Check that all harness connectors are plugged into the mating chassis sockets. Check various finger contacts on the RF deck and the Modulator deck to see that they are making contact. Check connections to the Speech Amp module. If you haven't already checked all of the relay contacts for condition, now is the time to do so. Be sure to check the Antenna Relay contacts (later versions use a vacuum relay so this step isn't necessary.) Check that the harness has all of its plastic loop supports and that they are keeping the harness positioned away from the chassis of the three decks. Reinstall the back cover making sure that the interlock is mating properly. Low Voltage Power Up - With the T-368 connected to 115vac, switch on just the FILAMENT POWER breaker. The green pilot lamp should illuminate. You are now applying low voltages to all tube heaters along with the screen and plate voltages to the Speech Amp and the low voltage rectifiers. If you turn on the Exciter Plate Voltage switch, you can measure the output of the Exciter from the front panel of the T-368. You can check the output of the Exciter at various frequencies to see if it needs alignment. All alignment adjustments of the Exciter are performed with just the low voltage on. Alignment requires a spline wrench to adjust the slug carriers, similar to the R-390A slug alignment. The procedure is covered in the manual. You can adjust the filament voltage to the 4-400 tube. If everything looks okay, you're ready for +HV. Toggle Switch Positions - Basic versions of the T-368 will have an Exciter Plate Voltage switch. This switch should be left in the off position when operating push-to-talk AM. Later versions replaced this switch with a keying switch that is marked KEYING-CONTINUOUS/NORMAL. Additionally, there is a Plate Voltage switch on the front panel of the power supply deck. This should also be left in the off position when operating push-to-talk AM. The Plate Voltage switch is turned on for CW operation. Also, the Exciter Plate Voltage switch is turned on for CW operation. 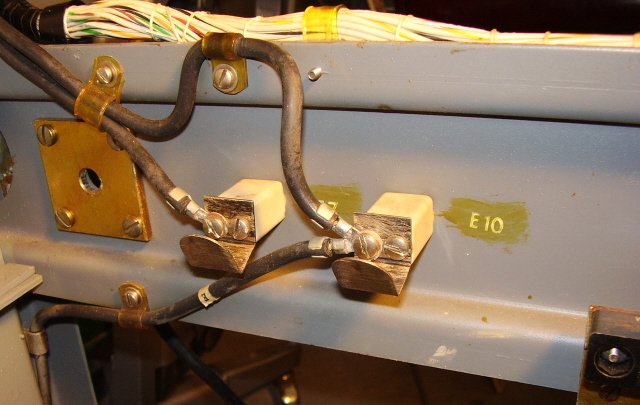 The TUNE/OPERATE switch is placed in the TUNE position if the transmitter is being tuned to an unknown load. This switch is marked TUNE/NORMAL on some versions. The plate voltage is reduced to allow "low power" tune-up. If the transmitter is connected to a known load, like the same antenna all the time at the same frequency, then the switch can be left in the OPERATE position since the transmitter should be "tuned" to that antenna load. +HV Power Up - Before powering up the +HV on the T-3, connect a 50 ohm dummy load to the Antenna connector on the left side of the transmitter. Be sure the dummy load is rated for at least 1KW. Even though the carrier level power will be around 400 watts any audio modulation will increase the peak-to-peak power to 1.5KW. With the T-3 connected to a 115VAC source, switch on the Filament breaker switch. The green pilot lamp should light up and the blowers should start up. Let the transmitter run on the filaments for a few minutes. Adjust the Filament control so the FIL VOLTAGE meter reads one division over 5.0vac. The EXCITATION meter has a three position switch to select various measurements. The SERVICE switch selects the mode of operation. Select AM. With the Exciter Plate switch OFF and the PLATE VOLTAGE switch OFF, turn on the PLATE VOLTAGE breaker switch. The red pilot lamp shouldn't come on. With a PTT mike connected to CARBON MICROPHONE connector and with the TUNE/OPERATE switch in the TUNE position, depress the PTT on the mike. You should hear the relays operate and you should see PA PLATE current on the meter. Dip the PLATE TUNING and then adjust the PLATE LOADING to increase the plate current. Dip the plate current. Alternate until about 125mA shows on the meter. Then place the TUNE/OPERATE switch to OPERATE and proceed with the plate tune and load until the plate current is up to 250mA. If you have a watt meter on the dummy load it should show around 350 watts. Check that the Excitation Meter reads between 8ma and 12ma in the GRID X2 position. Make sure the Excitation Meter reads between 20ma and 70ma in the INT AMP PLATE X10 position. With the Excitation meter in the MOD PLATE X20 position adjust MODULATOR BIAS for 50ma idling current. Speak into the microphone and adjust CARBON MIKE GAIN for around 200ma peak current on the Excitation meter. This should equal approximately 90% to 100% modulation. If you have an oscilloscope connected to the dummy load you can observe the waveform and see the modulation level. Continued from further up this page,... At this point, I applied power to my T-368. As expected, since it had been essentially operational for KØDWC, it did power up with no problems. RF output without modulation looked clean and the transmitter was running around 350 watts output conservatively loaded to 250mA. As I turned up the mike gain I began to notice hum modulation on the 'scope. I traced this down to the Speech Amp and to the fact that I was running the mike into the 600 ohm line at the rear of the transmitter. Since my T-368 is a very old version (1952,) its 600 ohm line shielded cables are grounded at every input and output connect throughout the harness. This can set up ground loops due to chassis currents within the transmitter. Later T-368s were wired differently to correct this potential problem. I ended up connecting the mike to the front panel connector with the carbon bias line disconnected. This eliminated the hum. Additionally, when operating with a crystal mike connected to the CARBON MICROPHONE connector you have to make sure the 600 OHM LINE GAIN pot is fully CCW. To further reduce the possibility of potential hum, I installed a grounded BNC connector to the 600 line input on the Speech Amp so the input has no connection to the 600 ohm line at all and the tube grid is at ground. This resulted in a clean audio signal. After a few minutes of operation on an antenna and while monitoring the signal in a receiver, I noticed a "crackle" in the audio of the signal. Looking at the 'scope showed the carrier would sometimes "break up" even without modulation. I traced this problem to extremely weak contact pressure in the antenna relay. The contacts were just barely touching when energized and apparently vibration from the transmitter blower would sometimes cause the relay contacts to "bounce." I readjusted the contact springs to provide positive, firm pressure and this eliminated the problem. After this, the T-368 output was clean and the audio quality was very good. I run the transmitter at 250mA of plate current and this produces about 350 watts of carrier power output. The transmitter can easily be loaded up to 400 watts but this technically could exceed 1500 watt PEP output, so, at 350 watts of carrier, everything is just legally cruising along and most components are barely above an idle. So far, operation has been reliable and reports have all been positive for both signal strength and audio quality. As with any transmitter with +2500vdc or higher plate voltage, periodic cleaning must be done. Although the transmitter air-intake has a large filter and the possibility of dust build-up is very low, it's still a good idea to check over an operational T-368 at least once every year. Operation Set-up - Remember that the T-368 is running 350+ watts carrier power output at 100% duty-cycle and that the voice modulation is pushing the upward peaks another 50% with the downward modulation extending to 0 or cut-off for 100% modulation. Converting these levels to a peak-to-peak rating, the T-368 can easily run 1500 watt pk-pk output (~375 watts of carrier that is 100% double sideband amplitude modulated (dsb AM) is approximately equal to 1500w pep output.) Be sure your antenna coupler, if you're using one, can handle this power level at 100% duty-cycle. Many modern tuners are rated at 1.5kw pk-pk for SSB or CW, both of which have duty-cycles at 50% or less. I've used the Johnson KW Matchbox with no problems. I've also used the Nye-Viking MB-V-A with no problems. Use RG-8/U coax for all RF connections from the transmitter to the antenna coupler or from the transmitter to a resonant antenna if no tuner is used. If you are running into the antenna directly, such as a resonant dipole or a vertical, be sure any balun used has a 2KW or higher rating. Don't use a trap vertical unless the traps are rated for 2KW. Dummy Load - Be sure your dummy load has sufficient dissipation. Most dummy loads are rated at power versus key-down time. The ME-165-G combination SWR Bridge and Dummy Load was used with the T-368 in some installations. The ME-165-G is rated at 200 watts continuous and up to 600 watts intermittent. Although I've used the ME-165-G on occasion, for testing I normally use a Harrison dummy load rated at 2500 watts. External Equipment that can Help - An oscilloscope can be used as a modulation indicator. A three-to-ten foot long wire can be used as a "pick-up" and the vertical amplification and sweep rate adjusted to give a good representation of the wave envelope from the transmitter. A digital frequency counter can also be connected to the same "pick-up" wire and used to verify the actual transmitter frequency. Although the frequency readout is pretty accurate on the T-368, the digital frequency counter will measure to better than 1kc accuracy with ease. I have this type of monitoring set-up and turned "on" for the entire time I'm on the air. Operating the T-368 - Before you actually put your T-3 "on the air" you should listen to it while loaded into a dummy load. Use a good receiver with a good bandwidth (6kc to 10kc is okay) with the audio output going to a good set of 'phones. Don't have an antenna connected to the receiver. You should pick up sufficient signal from the dummy load that allows you to listen to the character of the audio signal in this manner. In actual operation, your audio should sound very much like what you hear doing this test. The T-3 is a pleasure to operate. Unless you have a problem, or have the Clipper circuit adjusted with too much clipping (you don't need any,) you will get great audio reports. As mentioned before, the T-368 dominates the frequency of operation. If you run the transmitter into a good antenna you will always receive great reports, both for signal strength and for audio quality. Do not modify the audio chain except for adjusting the Clipper all the way down. You can disconnect the carbon mike bias line and run directly into the Speech Amp with a Astatic TUG-8 amplified base with a D-104 or similar head. This is just about all that the T-3 needs for good quality audio. photo above: My T-368 Basic SN:29 built by B& W in 1952. The receiver is a Collins 1951 contract R-390 in a CV-979 cabinet. 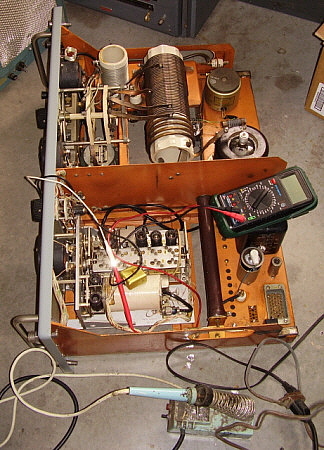 Note the oscilloscope and digital frequency counter above the receiver. These provide constant monitoring of the modulated wave form and operating frequency. The mike is an Astatic DN-50 body with a crystal element installed on a TUG-8 base. Note that the BC-939 and the ME-165-G aren't hooked-up. BC-939 antenna matching details are below in the "T-368 Auxiliary Equipment" section. For ease of use and best performance, I use the Nye-Viking tuner to match an antenna that is "two half-waves in-phase" on 75M (that's 270 feet of wire, center-fed with 77 feet of ladder line.) The Nye-Viking MB-V-A has a built-in watt meter and SWR bridge that constantly monitors the antenna matching and power output. 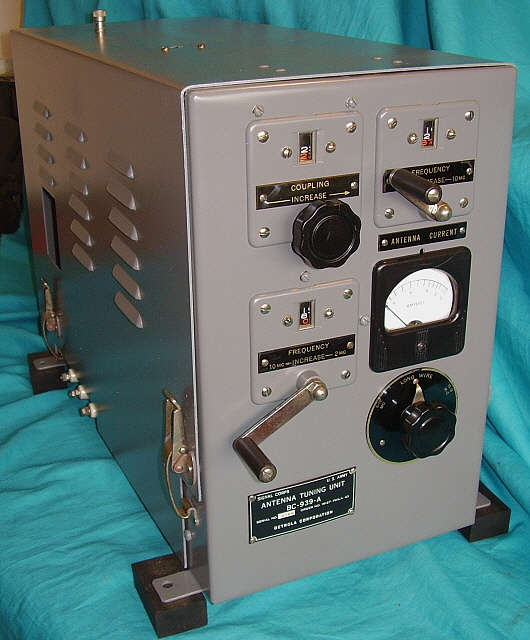 The BC-939-A was originally designed for the BC-610 transmitter during WWII. 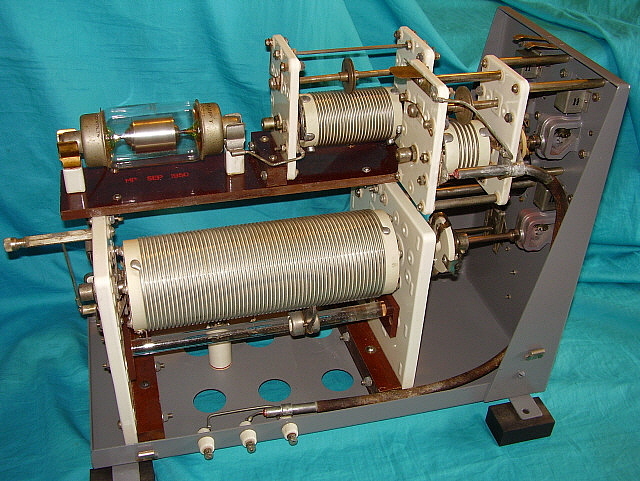 The tuner allowed the BC-610 to load into a mobile whip antenna that was about 20 feet in length. These vertical whip antennas were generally used on the mobile communications truck designated SCR-299. 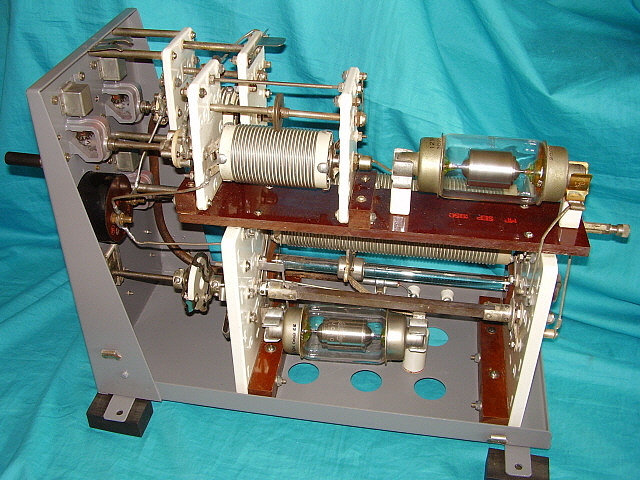 The tuner also had a position to allow it to match a random length "long wire" antenna to the BC-610. As would be expected, the ability of the BC-939 to match a wire antenna to the transmitter depends on wire length, transmitter frequency and the LC (adjustable L, fixed C) within the tuner. The large amount of variables in the set-up made random length long wires difficult to load. If a wire antenna was to be used it would have been a somewhat specific length for a typical frequency range in order for the BC-939 to match it to the BC-610 output. 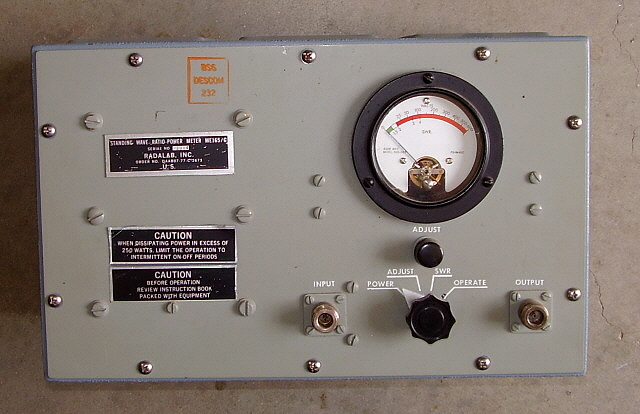 As the T-368 replaced the BC-610, similar requirements for the transmitter allowed the BC-939 to be used for basically the same purpose. 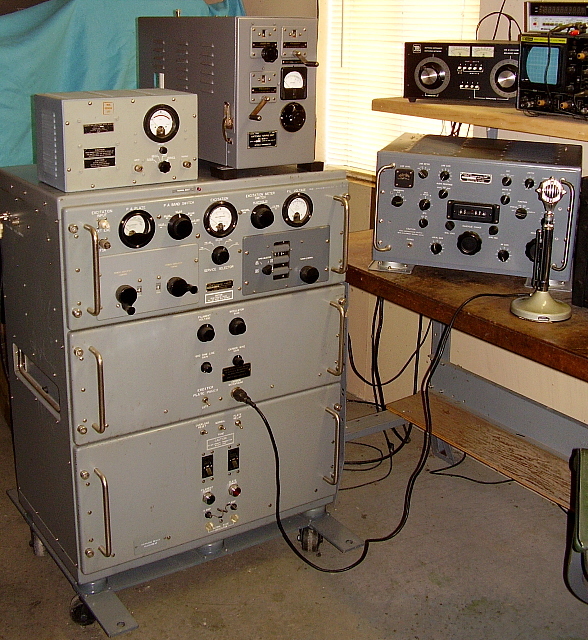 Most vertical whip installations were on semi-portable communications "huts" that mainly operated RTTY (AN/GRC-26.) The whips were approximately 20 feet in length. If location or installation required a wire antenna then the same variables of wire length and operational frequency had to be followed. Generally, the BC-939-B tuners that were installed with the T-368 were painted gray. Internally, the A and B versions are the same. The external difference is the types of spring latches that mount of the top cover to a base plate on the B version. The A version has over-center latches for holding down the top cover. The A version has flat metal mounting legs while the B version has metal extrusion legs that are much less resistant to bending. The BC-939A/B is robust in construction using large roller inductors and two fixed-value vacuum capacitors. Switching allows for three basic circuits. One circuit is for matching the whip antenna on low frequencies of 2.0mc up to 10mc (variable L only.) The second circuit matches the whip from 10mc up to 18mc (variable L series C.) The third circuit is a series variable L and fixed-value C allowing matching an ambiguously described long wire antenna. The design of the BC-939A/B assumes that the installation will be a specific length whip (five sections with each section being from three to four feet in length) or a fairly high-capacitance (short) end-fed wire antenna. Therefore when the BC-939A/B is used to match antennas that deviate from these two specific types, difficulty is encountered since the tuner doesn't have a large range of adjustability. >>> Experience shows that the wire antenna must be relatively short because really long wires will have too much inductance and that will be out of the range of tuner because of insufficient capacitance in the tuner. Relatively short antennas will usually have higher capacitive reactance and lower inductive reactance. One look at the BC-939 with its massive inductors but with a 12pf and a 55pf fixed-value capacitors and it pretty obvious that adding inductance was the objective of the design. This then implies using "short" antennas. Best results are with wire antennae that are less than sixty feet long for use within the 75M band. The manual states that some experimentation will be necessary to find a wire length that allows the tuner to adjust to a good match (a real understatement.) In the military, a random end-fed wire antenna would only have been used at a semi-fixed where long-distance communication was necessary. Also, since this antenna set-up was temporary, a relatively-high amount of SWR would be tolerated (as long as the transmitter could be loaded up the SWR was acceptable.) At fixed locations with well-designed antennae, the antenna feed was coaxial cable that was connected directly to the T-368 since the antenna was "cut for" a specific frequency and the impedance was between 50Z and 75Z ohms which could be easily matched using the transmitter's Pi-network. With this type of antenna the actual SWR would be quite low - in other words, the tuner wasn't necessary. For mobile operations, whip antennae were used. The BC-939 works best with a whip vertical antenna. Fifteen to twenty feet in length can be matched easily and the SWR will be very low. More specifics on the operation of the BC-939 in the "Performance" section below. Rebuilding the BC-939-A - The rebuilding of an old style antenna tuner is more of an electro-mechanical job than anything else. Turns counters, roller inductors, vacuum capacitors, clips and knife-switches make up the BC-939 circuit. Since the chassis and the cover are made out of heavy-gauge steel, the entire unit is quite heavy. I first saw this BC-939-A setting on the garage floor of my old friend, John KB6SCO. I had just purchased a vintage SP-100LX from John and then saw the tuner. The price was very reasonable but I passed since I had just bought the Hammarlund. Several weeks later, I asked John if he still had the tuner but he had "passed it along" to another old friend of mine, Rex KE7MFW. John related that Rex wasn't particularly interested in the tuner but it was included in a "package deal." A quick phone call resulted in Rex bringing the BC-939-A to the October 2016 Reno Ham Swap where I then purchased it from him. photo left: The left side of the BC-939-A. The transmitter is connected to the three ceramic insulated terminals providing a coaxial "hard-line" up to the Coupling roller inductor. The large lower roller inductor is for lower frequencies and long wire antennae while the upper smaller roller inductor is for the higher frequencies using a whip antenna. The 12pf vacuum capacitor is used in series with the smaller roller inductor for tuning 20 ft. whips above 12mc. The hex extension with the binding post connector that protrudes out the rear is the antenna connection. >>> The BC-939-A exterior was a combination of black wrinkle finish and rust. The paint was missing along the corners and in several other spots. The metal chassis had several bends and kinks in it, not severe, but noticeable. I really wanted to set the tuner up with my T-368. All photos I've seen of '939s with T-3s show a gray paint job on the tuner to match the T-368. All of these tuners are certainly BC-939-B versions and this one was an "A" version, built on a 1943 contract by Detrola Corporation. However, inside the tuner was a MFP stamp for September 1950, indicating that the unit had gone through a depot long after WWII had ended. It probably wasn't out of the realm of possibility that a military depot might have painted an "A" version smooth gray finish. Anyway, that was what I was going to do. photo right: The right side of the BC-939-A. The 55pf vacuum capacitor can be seen mounted next to the lower roller inductor. The lower roller inductor and the 55pf vac-cap are connected in series for matching "long wire" antennae. The square shaft above the vac-cap couples the front antenna switch to the rear antenna switch. The antenna switch selects whip antennae on 2mc-10mc or 10mc-18mc or it can select Long Wire. >>> Warning - A Consumer's Opinion - I usually don't pan products but JASCO's 15 min. Premium Paint and Epoxy Stripper has had a formula change. I've used this product in the past with no problems however it had probably been over five years since I'd done any projects that required methylene-chloride stripper. I bought two cans at different locations at different times and both cans had the same problem. The JASCO stripper is the consistency of Jello that will not spread. It smears around in gelatinous lumps that won't cover the paint evenly, if at all. Now,...it does strip,...eventually,...but it is virtually impossible to spread. It's like trying to strip paint with Jello. This makes the job take much longer than necessary because of the multiple applications required. I used the JASCO on the chassis but purchased a can of Klean Strip, which is also a methylene-chloride stripper, to strip the cabinet. Klean Strip has a good consistency (about like a thin milk shake) and worked quite well only requiring one application. NOTE: The JASCO change is probably due to the hazardous nature of methylene-chloride vapors. The gelatinous consistency limits the vapor to a certain extent. This probably goes back to the OSHA write-up on methlylene-chloride which recommends using the thick consistency stripper rather than the liquid-type. All work with this type of stripper MUST be performed outside with ample ventilation. DO NOT use methlylene-chloride in a non-ventilated area. Nitrile, neoprene, latex or any of the commonly found gloves WILL NOT protect your hands. You have to use PVA (polyethylene-vinyl layered) gloves, which are difficult to find. Even then, you should first put on a pair of Nitrile gloves and then the PVA gloves. Only use methylene-chloride stripper when no other type of stripper will do the job. Back to Rebuilding - Once the paint was removed then the metal parts were cleaned with high-pressure water and then Glass Plus. I then did the body work (straightening the bent metal) followed by wet-sanding the metal with 600 grit Al-Ox paper and Glass Plus. This was followed by a wash with lacquer thinner. Next, I red-oxide primed the metal. The final paint job consisted of two coats of Rust-oleum American Accents "Satin Granite" which is a satin finish medium gray and very close to the standard military medium gray color. I let the paint set for several days before performing reassembly in order for the paint to be hard enough to prevent marring. I also noticed that the Satin Granite paint is a very low odor type of paint. After four days setting, the paint had no noticeable odor and was moderately hard. VC-12 Located - As mentioned, the 12pf vacuum cap was missing. I thought I was going to have to search for awhile to find the correct part. I took a look a eBay not really expecting much. Searching "vacuum capacitor," on the first page about five down, there was a Jennings VC-12. I couldn't believe it! Then I took a look at who was the seller,...Ham & Hi Fi in Sparks, Nevada. I never expected to find VC-12 within about 5 minutes of looking and have it located about 25 miles away. I acted on the reasonably-priced BIN and picked-up the VC-12 the next day. Reassembly - Mechanical alignment has to be carefully performed when reassembling the BC-939. The couplers on the two upper roller inductors don't have flexible hub mounts so the alignment of these two inductors has to be accurate so as not to break the ceramic insulator. The lower switch and inductor should also be close in alignment but since the couplers do have flexible mounts their alignment isn't as critical. I had to use heavy paper shims on the high frequency roller inductor mount to get the alignment correct. The other two roller inductors and the switch aligned using their mounting adjustments. It's possible to get the antenna selector switch out of synchronization. Watch the rear contacts versus the front contacts and it becomes apparent how the switch should be positioned before the coupler is tightened. Since the chassis had been bent, the ceramic insulators for the tuner output connections were broken. Although the outer ceramic pieces were in good condition, the internal ceramic that passes through the chassis metal was broken on two of the three insulators. I used epoxy to glue the internal ceramic pieces back together to correct the problem. The top cover also has a connection piece in the top. It is a ground connection that goes from a top binding post through the cover to an internal contact that presses against a flexible contact plate on the Coupling roller inductor which accomplishes a ground connection at that point. Although the BC-939 is grounded to the transmitter at the side terminals this top connection is used if coaxial cable is used to connect the whip antenna to the tuner. The shield would connect to the top cover binding post and the center conductor would connect to the binding post inside the large circular opening at the rear of the tuner-cover. Performance - Not good news for wire antennae - I decided to do my testing at low power - really low power. Rather than using the T-368 for testing, I connected up a Viking Ranger. This limited the RF power to less than 50 watts for testing. Since both the T-368 and Ranger use a Pi-L network type output, the results should be comparable as far as settings and functionality. Once low power applications seem to work then going to high power would show any arcing or other high power problems that might happen. Futile Empirical Experimentation - I already knew what to expect but I had to go through the experiments anyway - empirical proof and all that sort of stuff. My first attempt was to load my "two half-waves in-phase" antenna with the feed line shorted and then worked against ground. I thought this might work as some sort of random wire antenna load however that antenna had way too much inductance for the BC-939 to provide matching. I tried just one "leg" of the antenna with similar results. Next, I connected a 20 foot long piece of wire. With this "antenna" I could get a very good match on 75M with the BC-939 set for the whip antenna 2mc-10mc range. My next test was to try a 67 foot end-fed wire. I suspected that the "long wire" antennae for the military wasn't really all that long and was probably something easy and quick to erect. I was able to somewhat match the 67 foot wire antenna on the 75M band but the SWR was rather high at about 6:1. It appears that if one really wanted to use the BC-939 with a end-fed wire antenna then a lot of experimenting would be needed to find a wire length that's within the BC-939's tuning range for the intended frequency of operation. Another Futile Experiment - Obviously, the problem with the BC-939 and random-length end-fed wire antennae is not enough capacitance available in the BC-939. Why not add an external C in series with the wire antenna? A large air variable could be connected in series between the antenna and the tuner and then adjusted to give the best match with, for example, a 125 foot long end-fed wire. So, first I tried 125 feet of wire with a 100pf variable in series between the BC-939 and the antenna. I varied the capacitance from a low of around 15pf up to the 100pf and could not get the tuner to match the 125 feet of wire. I tried both "Long Wire" and "2mc - 10mc" positions with similar results. Next, I went back to the 67 foot wire antenna with the variable-C in series. With this set-up I was able to get a match but the minimum SWR attainable was 6:1. The next test is to use the air variable C in parallel with the antenna. This test result will be coming soon. 20 foot Vertical - This antenna is an actual Army antenna with insulated base. I've mounted it on the side of the shop and use a vertical drop ground wire about six feet long that connects to a ground rod. To Sum it Up - While there might be a combination of external L or C that might "help" the BC-939 to provide a good match for a "long wire" antenna, it seems to go against the idea of trying to use the equipment "as originally intended." With no external L or C, the best results were with less than 60 feet of wire and while this could be loaded the mismatch was fairly high unless the wire was around 20 feet in length. Perhaps with endless patience a "magic length" long wire could be discovered for a certain, specific frequency but it appears that "random length" long wires cannot be matched. In the military, a long wire would only be used if communications distance wasn't possible with the vertical whips. This meant that rarely, if at all, would the long wire antenna be used and then if the SWR was 5 or 6 to 1, it didn't matter since it would only be for a short time period. In the Army, if the transmitter could be loaded into the antenna, then the SWR was acceptable. After all, communications was of the upmost importance. Whether the final amplifier tube survived was secondary since spares were always available. Our experiments seemed to conclude that the BC-939 was primarily designed to match a 15 to 20 foot long vertical whip and it does this function rather well. The Manual versus Reality - Why the manual TM11-5820-256-10 states that the BC-939 can be used with a dipole antenna is a mystery. I've talked to old ex-army radio ops that actually used T-368s and this is what they say. "The BC-939 was only used to match the whip antenna to the T-368. The other antenna available was a reel-out doublet. With that antenna, we'd calculate the antenna length needed, reel out that much metal tape and then connect the coax directly to the T-368, bypassing the BC-939. At fixed locations we had a specific fixed-frequency that was always used and the antenna was cut for that frequency. The coaxial feed went directly to the T-368." The ME-165-G is a military SWR Bridge with the capability of operating as a Dummy Load with Watt Meter. The Dummy Load is comprised of several wire wound resistors that total 50 ohms and has a dissipation of 200 watts continuous. Although the front panel tag indicates that power levels in excess of 250 watts must be limited to intermittent operation, the dummy load can dissipate up to 600 watts but only for short on/off periods. The meter scale is 600 watts FS. The SWR Bridge works like any of the older style bridges. With RF power going into the bridge, select ADJUST. Then use the ADJUST knob to set the meter to read full scale. Then switch to SWR and the meter will indicate the SWR. The switch also has a position for OPERATE that allows bypassing the bridge entirely. The POWER position switches in the dummy load and the meter will indicate the RF watts input to the dummy load. The input and output connectors are Type-N coaxial receptacles. The ME-165-G was usually mounted to the hut wall adjacent to the T-368. The ME-165-G was included in the equipment installed in the AN/GRC-26. Since there is an OPERATE position which bypasses the bridge, leaving the ME-165-G connected between the transmitter and antenna results in no losses in the OPERATE position. The ME-165-G shown in the photo to the right was built by Radalab, Inc. .
UPDATE - August 3, 2017 - I had been noticing for about the past six months (or more) the RF power output on the T-368 was slowly decreasing. I'd increase the PLATE LOADING and, for a while, RF power would be back up to around 375 watts. For the past few months, I couldn't get much more than 300 watts RF output and if the PLATE LOADING was increased enough, the RF output would decrease instead of increase. This is "classic case" of a PA tube getting weaker and weaker. I had been given a 4-400A to try but it was pretty dark inside. The more time on a PA tube and the harder it is "worked" the more darkening happens on the inside of the glass envelope. I was sure this tube, if it did improve the RF output, wouldn't do so for very long. I was up at Ham & Hi Fi in Sparks, Nevada on August 2nd and while looking around I remembered that they had some "tested" 4-400A tubes up on eBay. >>> >>> The testing was done by my old friend, KB6SCO, and I was familiar with John's methods and his set-up. He used various power supplies running +2KV on the plate and +500vdc on the screen then starting at -100vdc bias, reduced the bias by increments of five volts and measured and logged the plate current at each point. The test data was attached to the tube. I could see that John had gotten about 480 watts on his test at a bias level of -50vdc (Ip x Ep.) I figured this was a pretty good tube. So I purchased the 4-400A and installed it into the T-368 the next morning. Not that there weren't problems, however. It seemed that a "heavy-wristed" installer had broken off the screw that held the plate cap heat dissipater to the tube plate cap. I had to drill out the broken screw - luckily, it was a brass screw. Once the screw was drilled out the dissipater cap could be removed. I had to chase the threads and install a new brass 6-32 screw. That allowed everything to be reinstalled with the new tube in place. Power up and the RF output was 400 watts at 240mA of plate current. Very nice. On the air tests on the Sunday Vintage Military Radio Net garnered many positive reports on the improvement. Well,...probably most of the compliments were due to a change in microphones - from a DN-50 head with Kobetone element to a D-104 head with original Astatic element - but still, the 4-400A helped. 2. Thanks to W6AQU, W6MIT, K6RAR and many others for their insight and experiences with T-368 transmitters.